The chaotic spectacle of this classical music-rock concert was undone when things got political. Joey Sims reviews. Right up until Anne Frank’s appearance, Rocktopia made some sense. 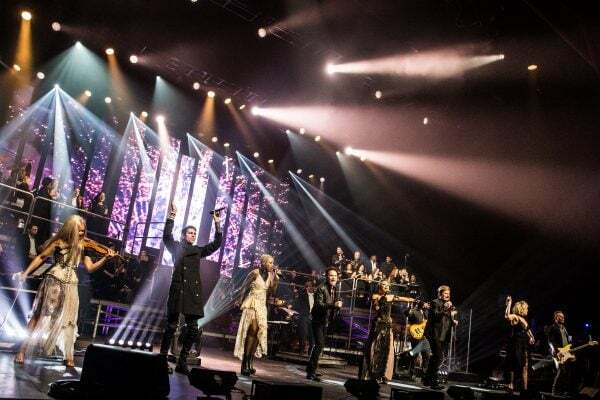 Billed as a concert mashing up classic rock and classical compositions, Rocktopia is even simpler than that might sound. A sparing orchestra plays the first two or three minutes of a legendary classical piece – “Also Sprach Zarathustra,” “The Rite of Spring,” etc – before quickly segueing into a similarly ubiquitous piece of classic rock: “Come Sail Away,” “Purple Haze,” and so on. The classical works are distant memories by the end of most numbers, quickly dropped in favor of belting takes on reassuring rock staples. Projections on the back wall include everything from blossoming flowers to historic world events, most pairing incongruously with each song. Good one or not, that’s the idea. Rocktopia’s first act passes mostly in this dumb, inoffensive vein. Co-creator and lead vocalist Rob Evan opens with The Who’s “Baba O’Riley,” bringing none of the youthful energy required. Tony Vincent of The Voice (and Broadway’s American Idiot) attempts Hendrix’s “Purple Haze,” followed by Chloe Lowery’s rendition of Heart’s “Alone” – both are vocally strong and passionless. Kimberly Nichole delivers a slightly more emotional “Dream On.” Pat Monahan of Train is the special guest – he appears mostly bored. (Dee Snider of Twisted Sister will step in later as the special guest in the show’s limited run, followed by Robin Zander of Cheap Trick.) Classical works do act as lead-ins but, like I say, it scarcely matters. There is no unity between the differing styles of music–though the resulting chaos does make for an oddly entertaining spectacle. With a shift into Muse’s “Uprising,” however, Rocktopia takes a turn for the truly strange. Walking in, I did not know what a Rocktopia was exactly, but I did expect it would provide me some disconnect from reality. That proved naive. “Time the fat cats / Had a heart attack,” Vincent screams, as images of America’s most violent political protests flash by on large screens behind him, including everything from 1960’s Civil Rights marches through Occupy Wall Street. I’m not sure Rocktopia has any business getting political, particularly in times like these. (Rock-Dystopia?) “Special Guest Vocalist Pat Monahan” does not segue naturally into, say, remembering the lives lost at Kent State (which is among the famous images included). I hoped this fuzzily political number would prove a momentary lapse. The first act finale did bring us back to comforting unreality, as the Rocktopians took turns butchering the final note of Puccini’s “Nessun Dorma.” “Come back for act two!” Evan pleaded, surprising a few audience members already throwing on their coats. For the second act of Rocktopia, death and structural inequality are on the docket. As Evan sings “Where the Streets Have No Name,” images of glass palaces and slums fly by. That’s only slightly tone-deaf compared to Vincent’s “We Are The Champions,” played here as a tribute to great figures in history. A jaw-dropping series of faces gazes down lovingly as Vincent wails – Abraham Lincoln, Mother Teresa, Martin Luther King Jr. Finally, Rocktopia hits an astonishing crescendo of poor taste, as Anne Frank’s smiling face glides past. Anne Frank’s cameo pretty much knocked me out for the remainder of the night, so the rest is something of a blur. “Don’t Stop Believin’” combined with Beethoven’s “Ode to Joy”? Sure, why not. Two encores? Hey, why not three. The crowd’s frequent cries of “do Drops of Jupiter” are satisfied, as Monahan resignedly steps out and, sings his hit song. He sounds great and looks miserable. I am still thinking about Anne Frank. I will spare you any Rocktopia opinions framed with “as a Jew” – the show is too gleefully hilarious to be actually offensive. Sure, the Rocktopians probably should have stayed in their lane (so to speak), but what delights that would have denied me. Nor can I refute the pleasure of my performance’s opening moment: when Evan’s microphone immediately failed, the audience promptly jumped in to sing most of “Baba O’Riley” for him. “Live theater!” grinned Evan, warmly acknowledging his appreciative crowd. And for but a moment, we were all Rocktopians.